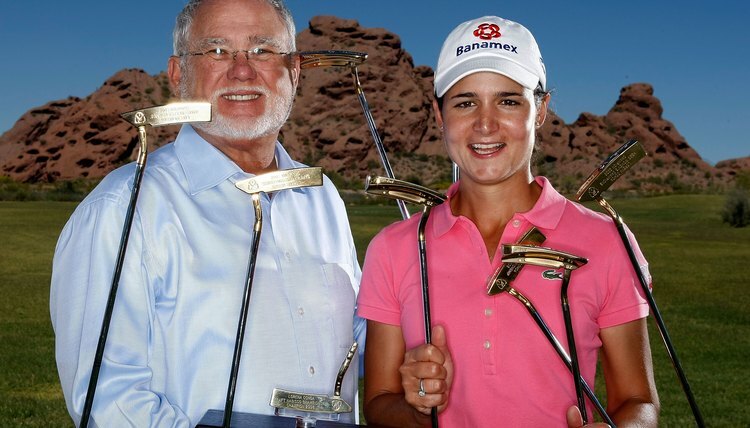 Solheim began making Ping putters in his garage. In 1959, a man working in his California garage changed the face of the golf industry. Karsten Solheim, then an engineer with GE, designed and built a putter based on a new idea--heel-toe weighting. The popularity of this putter led to a new company called Ping Golf and allowed Solheim to develop several other revolutionary ideas in golf design that have become nearly universal in the industry today. Karsten Solheim was an inveterate tinkerer. He started building putters in his garage and continued to work in his spare time throughout 1959 until he came up with what he called the 1-A, an offset, heel-to-toe weighted putter that offered unusual consistency of stroke and roll of the ball. After the putter was declared as conforming to golf rules by the USGA, it was introduced to tournament golf by a few players on the PGA Tour. The 1-A generated terrific interest among PGA professionals, and through them the public. Ping's first victory on tour came in the 1962 Cajun Classic Open--won by John Barnum--and the company never looked back. Throughout the 1960s and into the 1970s the putter's popularity continued to grow and Ping developed new cast iron clubs that implemented the same type of weight-shifting design, now called "perimeter weighting." The company has grown into one of the largest golf manufacturers in the world and produces everything from putters, irons and drivers to clothing, bags and accessories. Solheim's putter design removed much of the mass--or weight--of the putter head from the back of the center of the club and moved it to the heel and toe of the club. He designed an offset neck attached toward the heel of the putter, all of which expanded the sweet spot and all but eliminated mis-hit puts. It also introduced a ringing sound when the ball was struck. That sound--the "Ping"--became the name of the company. Solheim's design principles have been adapted by golf club designers in every corner of the industry. Ping players have won events at every level of the sport from junior and club events to amateur championships and all four modern major championships. Perhaps the most well-known player to use a Ping putter in his prime was Tom Watson, who won all eight of his major championships with the club in his bag. Ping putters remain popular at every course in the country, but most telling is how many other manufacturers have utilized the heel-toe weighting, offset hosel and hollow-back design principles introduced by Solheim and Ping. Just about every manufacturer today utilizes some version of these principles within their putter lines.